We ordered 5,000 SoundCloud Plays from SocialProof to see how well they could deliver their service. Unfortunately, we never got the plays we bought. 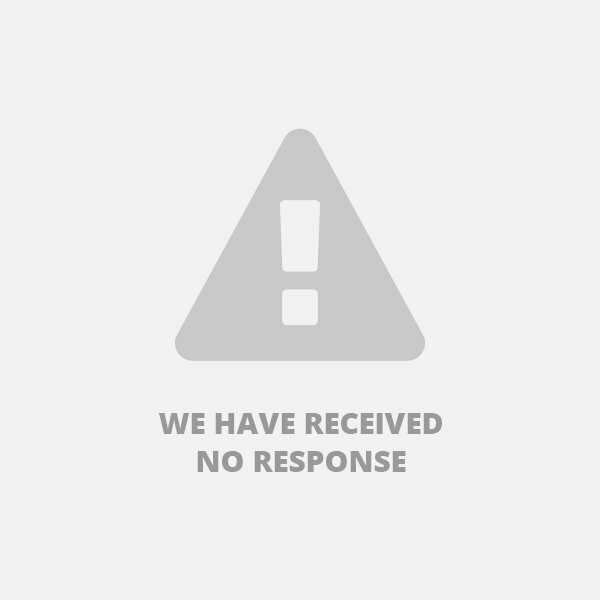 Customer support was also unresponsive to our inquiry, never responding to our questions. They do have decent protections in place, but you might have a hard time getting in touch with them. Overall we suggest you go with a more reputable company like those found on our list of the best providers. Located in Long Beach, California, SocialProof.xyz is a social media marketing company that has been in the business since 2009. 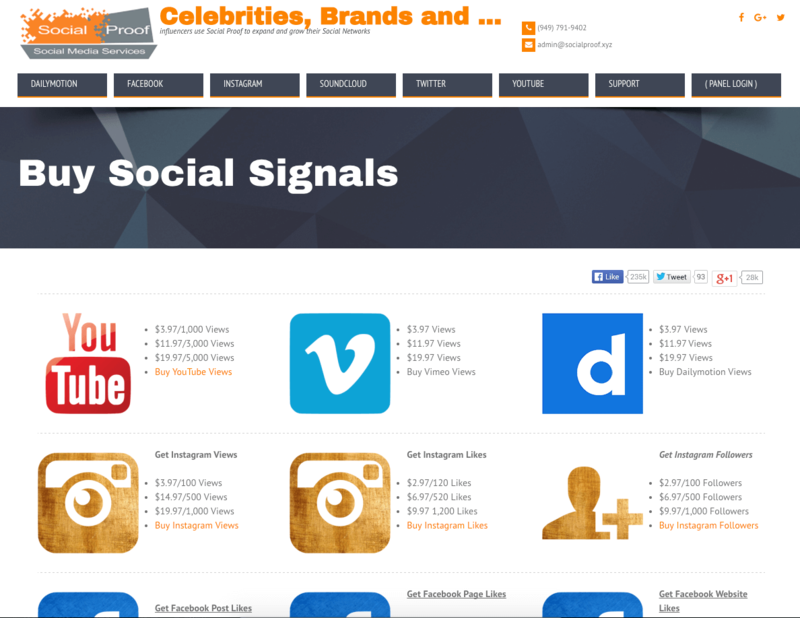 They supply engagement signals to help your websites and social media accounts rank higher and become more popular. They offer social media boosting services for platforms like YouTube, Vimeo, Dailymotion, Instagram, Facebook, Twitter, and SoundCloud. SocialProof.xyz provides SoundCloud Downloads, Followers, and Plays. 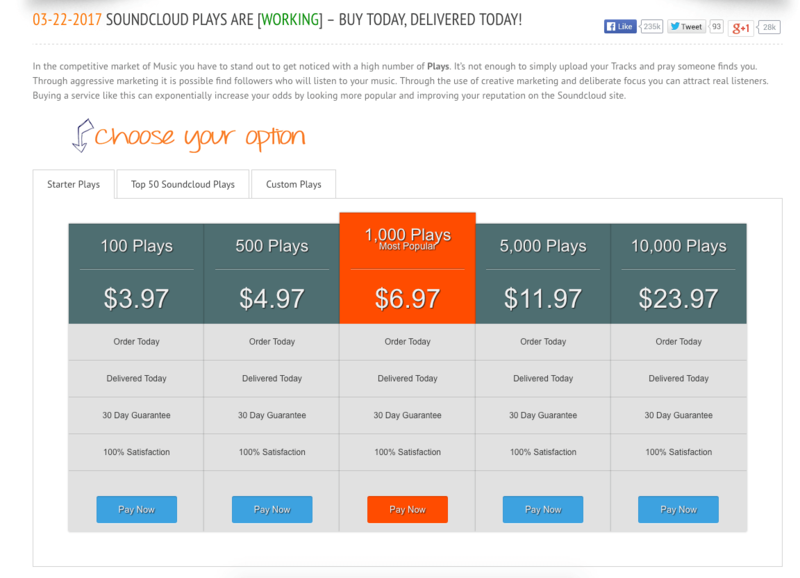 In addition to the plans shown, you can also place custom order for any number of plays between 100 and 1 Million. We reviewed the terms and conditions sections on the SocialProof website and made a few comments on their status below. To find out more details on these, then please toggle the sections to see what we thought! SocialProof.xyz has a standard Terms of Service. They do not guarantee that the quality of their services will meet your expectations. They value your privacy and will not disclose information you provided unless required by the law. They may ask you for personal information for marketing purposes but will not use them without your expressed consent. SocialProof.xyz offers a 100% Money-Back Guarantee. Their Money-Back Guarantee has a 30-day validity period. You can send a message to SocialProof by clicking the Support button towards the right, and then submitting a ticket. Before we ordered, we sent some questions to SocialProof to test how well their customer support would respond. Unfortunately we never got a response back from them. We'll update this section if that situation changes. After ordering, we usually send another set of questions to see if they treat a paying customer differently. We'll update this section if we get a response to our first questions. Since we never got the Plays we ordered, we don't recommend the services of SocialProof. Instead, we suggest you take a look at the services of Devumi or BuyPlays. We never received the plays we bought from SocialProof, unfortunately. At this point, the turnaround time is nonexistent! Our test of 5,000 SoundCloud Plays from SocialProof didn't go so well. The Plays never arrived, even a month after we placed the order. Their customer support was unresponsive as well, and we still haven't heard back from them about our questions. Overall we don't recommend the services of SocialProof if you want to boost your SoundCloud reputation. Instead, check out what better SoundCloud Play providers have to offer you. The plays i ordered arrived in time and were of good quality. The customer support was also very friendly and knowledgeable. I recommend them to anyone looking to improve their social proof. I ordered my plays and got them in less time than I had anticipated. The customer support were at hand to answer my queries especially regarding protection and true to their word I got all my plays. After buying SoundCloud subscribers, I have seen increased engagement across the tracks that have been uploaded since then. Contrary to other reviews I get to see here, my experience with socialproof's soundcloud services, specifically for plays, was quite good. I purchased 2k of them and they did it. I have tried growing my soundcloud following using various services as available on the internet. This too was one I tried and the results didn't have much uniqueness.